Hard boil the eggs according to the instructions on the carton. Leave to cool completely, then peel. Meanwhile, combine the sausagemeat, oregano and sun-dried tomato paste and season. Divide the mixture into 12 balls, flatten each ball and place a peeled egg in the centre of each. Wrap the meat around the eggs, ensuring the eggs are fully covered. 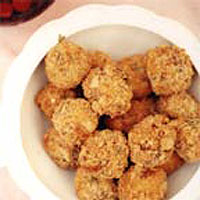 Roll the balls in the flour, then dip in the beaten egg, then the breadcrumbs. Heat the oil in a deep pan, or deep-fat fryer, to 160°C (or until a cube of bread turns golden in about 40 seconds). Deep fry the eggs in batches, for 7-8 minutes, until they're deep golden brown. Remove with a slotted spoon and drain on kitchen paper. Don't pack them for your picnic until they're completely cold, or they will go soggy.